CANNES SUPERBE T2 en Rez de Jardin de villa avec PISCINE PRIVÉE QUE POUR VOUS ! Appartement idéal pour 2/3 adultes maximum et 1 enfant (ou/et bébé) pour un séjour professionnel, congrès, en famille ou séjour romantique !! Vous bénéficierez d'un dépaysement, d'un confort et d'un standing dans l'intimité la plus totale !! Vous logerez dans un très bel appartement climatisé avec une entrée indépendante au rez de jardin de notre villa, plein Sud, dans un décor Méditerranéen : séjour avec cuisine américaine entièrement équipée et aménagée (réfrigérateur, micro-onde, plaque vitrocéramique, four électrique, lave vaisselle...) *1 Salle de douche équipée à l'italienne avec wc, décor moderne et original, sèche serviette électrique et Sèche-cheveux. *1 chambre avec un grand lit NEUF 160 x 200 (2 adultes) placard de rangement et penderie. *Séjour avec 1 canapé convertible (couchage 130 x 190) (1 adulte), téléviseur écran plat, connexion Wi-Fi gratuite et petit salon. Dans quartier résidentiel de Cannes à 15/20 mn à pied ou 5 mn en voiture, bus ou Taxi . Places de Parking dans la rue gratuite et bus devant la maison. Aucune autre personne (que celles prévues lors de la réservation) n'est autorisé à séjourner dans l'appartement , le jardin et à bénéficier de la piscine. We had the most wonderful 2 weeks in this little haven. It was perfect for us! Nathalie was lovely and incredibly welcoming, we loved everything about this little love nest!!! Perfect for my husband and I to just get away from it all but also close enough to the town for dinner and drinks and wandering around Cannes! The pool and garden area is just perfect!! Before booking I would just say that it is less than a mile to Cannes however the walk/drive is very steep!!! Too steep to manage in heels so we got a cab to and from when we went out. Also if you are driving like we were parking can be tricky outside of the property as there are only limited spaces. Also if you are susceptible to bites the mosquitoes are vicious so go prepared! Thankyou Nathalie and Jacques for welcoming us to your home and allowing us to totally relax and have a wonderful holiday!!! The Villa is perfect and is not far from the centre of Cannes, the only thing is the walk down is fine but the walk back is up a very steep hill, but my husband and I got taxis (which were very easy and fast) up and down for around €10! 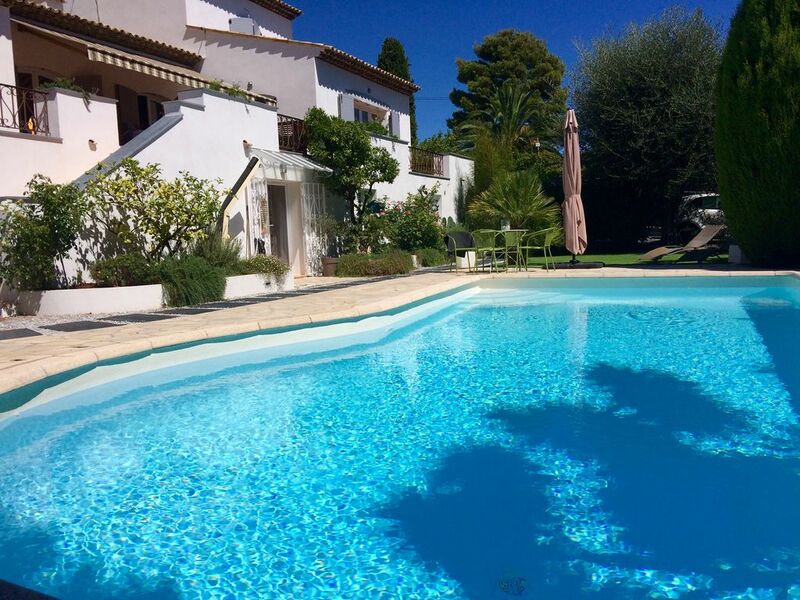 The Villa is perfect, it’s very pretty and immaculate, the pool is also great and has great sun all day! Nathalie was so helpful and kind, and we loved our stay! Thank you so much! The property is really lovely, spacious,clean and perfectly equipped. We really enjoyed our stay. Having use of the pool was amazing . Everything about this property is well though out and looked after. Very comfortable property and convenient location. Very comfortable and well equipped apartment. Our stay in Cannes couldn't have been better. Nathalie, our hostess, was very pleasant and provided an apartment that was both clean and spacious with a beautiful, landscaped setting. The walk into town was not far with the biggest bonus being that we were away from the crowds and hum of traffic and pedestrians.